Nothing excites a cook more than discovering a new tool, a new technique, or, in this particular case, a new ingredient. We came across agretti, an Italian specialty green, last season through Seeds from Italy, and vowed to give this annual succulent a try. Though purportedly easy to grow, the seeds have a notoriously short period of viability. It was with some trepidation that we direct seeded a short row, and were thrilled when they began to sprout. And then they dismally failed, not because of the seed so much as something ate them before they could get past the seedling stage. This is difficult to describe, like describing a truffle. 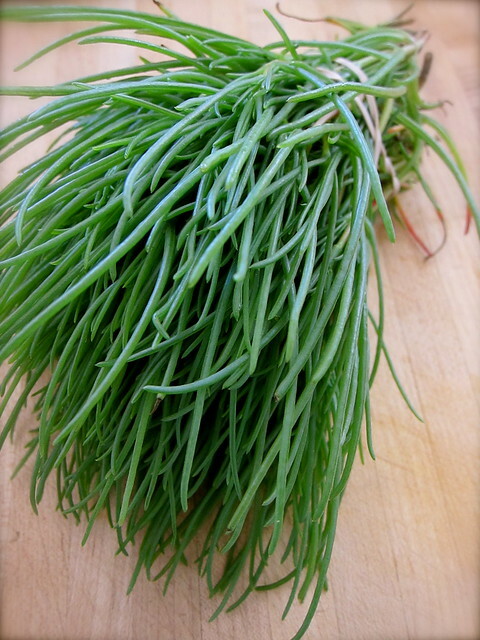 It has some other names: barba di frate (monk’s beard), roscano and salsola soda. It’s a mild-flavoured green, which is a little bit bitter, but a lot wonderful. Really only known in Rome (Lazio generally) and Umbria, it’s impossible to find in the UK and very, very gastronomic. It’s a bit like sea samphire, but you grow it in the ground rather than on salt marshes, which, let’s face it, not many of us have in our back gardens. It’s the flavor that makes agretti so alluring. It tastes like spinach, asparagus and sea water, and looks like chives with fat, rounded leaves. 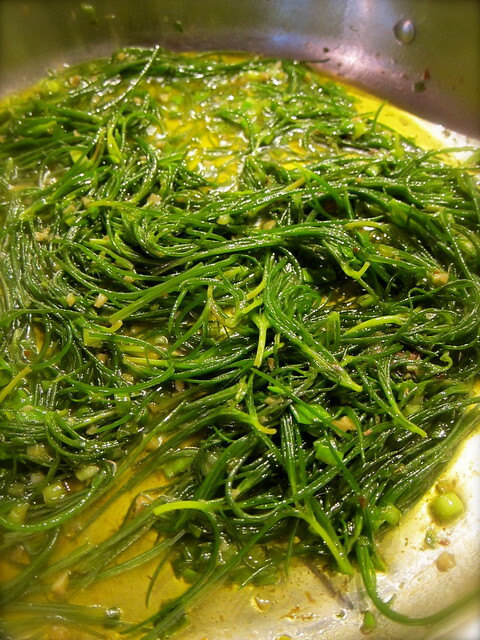 Agretti goes well with fish and seafood. You can use it raw in salads or you can cook it and use it in pasta. Try it braised with a little garlic and served as a side dish, boiled and served with olive oil, or take a large handful and slap a sea bass in the middle to steam. Raw, it’s fleshy leaves are crunchy and slightly saline, perfect as a salad ingredient. For cooking, it’s often suggested to blanch the agretti beforehand; this would seem advisable further along in the season, however, at this stage, the bunch we had was still young and tender. We began by stripping the leaves from the central stem, much as we would with rosemary. An experimental handful was thrown onto a pizza, where it mingled companionably with shredded kale, spring onions and fresh mozzarella. The dry heat of the oven had the unfortunate result of making the pizza look as if it were strewn by grass clippings but, one bite and it’s appeal was immediately clear — the agretti holds onto its sprightly texture even when cooked. There are numerous ways to use agretti — Mariquita Farm in California has a notable collection of suggestions they’ve crowdsourced from their CSA. For the most part, and understandably so, the recipes available online are in Italian. We wanted to make sure that however we cooked it, that it didn’t overwhelm the agretti, and the preparation Spaghetti con gli agretti per la Veronica caught our eye. We gathered that this recipe’s adapted from someone named Felix, though, even with many years of studying Italian (past absolute, sul serio? ), we could never figure out who Veronica was. In this dish, the agretti is seasoned with anchovies, garlic, and spring onions, to which we added a pinch of peperoncino, or red pepper flakes, and the zest from a lemon. The anchovies meld into the olive oil-based sauce and ground the dish flavor-wise, though can be omitted for those of you who’re phobic. The half pound of agretti we had on hand was about the right proportion for a pound of pasta, though don’t hesitate to add more if you have it. This beguiling combination of flavors and juicy toothy texture left us hopelessly addicted, and we can’t wait to see it start appearing at our local farmers’ market. Thank-you, Abby! – Place a large pot of water on heat, and bring it to a boil. 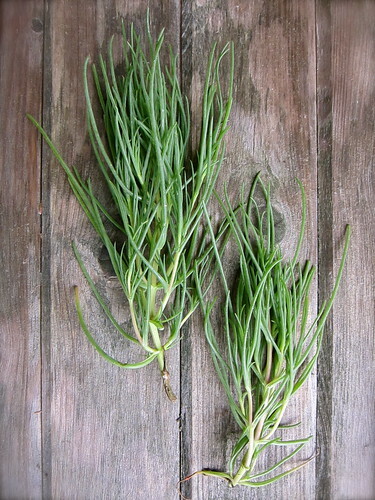 Meanwhile, wash the agretti well, then remove the leaves from the woody stems, discarding the stems. If the leaves are mature, blanch the agretti briefly in the boiling water, drain and set aside. – Salt the boiling water and add the spaghetti. While the pasta is cooking, sauté the garlic, spring onions, anchovies and peperoncino until fragrant. Add the agretti and continue to cook until tender but still crunchy. Remove pan from heat. 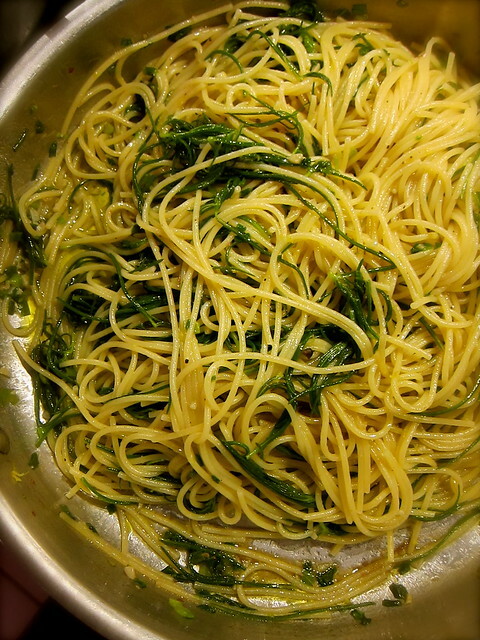 – When the pasta is al dente, add the spaghetti to the sautéed agretti; loosen with more pasta water if it seems too dry. To finish, toss with the lemon zest, some fresh olive oil, and season to taste. 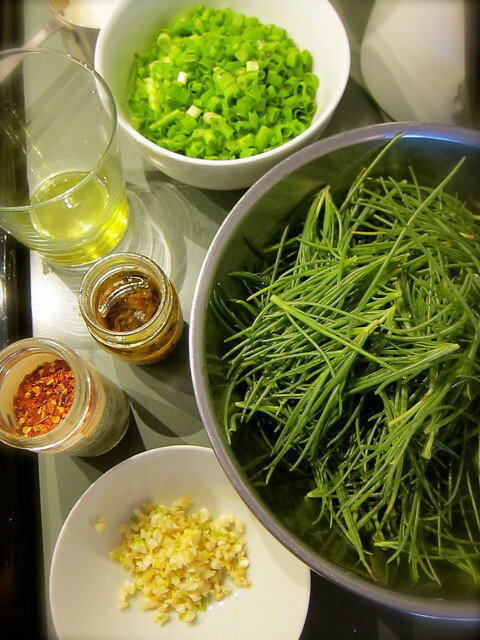 Local ingredients: Agretti from Wake Robin Farm; garlic and spring onions from the garden. 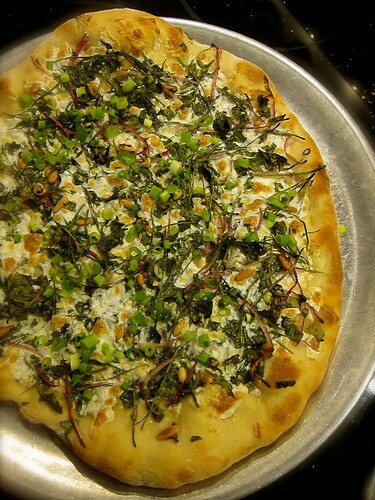 This entry was posted in cooking, garden and tagged agretti, alliums, kale, pasta, pizza. Bookmark the permalink. The remembrance of it still makes me excited! I hadn’t heard of agretti before and now I am very, very intrigued. I did a quick google search and so far I can’t find an Australian supplier but I will definitely keep trying as it sounds really interesting. I’ve not yet tried agretti, the one time I was given some seeds I could not get them to germinate, I guess they were old. Now you’ve inspired me to seek out some fresh seeds! Seeds of Italy recommends planting the seeds within 2 months of receiving them. We’ve kept the seeds in the fridge, and will have another go at them. I read that normal germination rate is 35–40%, while Seeds of Italy lists minimum germination of 65%. Abby said she had a germination rate of 70%, which may be the lowest of what she grows, but high for agretti! To ensure you get the freshest seeds, the best time to order is during winter, before the growing season. Fabulous. Saw agretti and had it for the first time in Rome in April. I have never seen it here, but maybe someday. I love this blog! You are constantly coming up with things that intrigue me. Thanks to you, more than half of the tomatoes I’m growing this year are winter storage varieties like Ponderosa Sel Oro, A Grappoli D’Inverno, and Principe Borghese. I’m trying to grow as many of the vegetables we eat as possible, so this will stretch the tomatoes into the winter months here in upstate NY. I’m excited about the agretti, as I don’t eat any grains, so my “pasta” is usually julienned and lightly sauteed zucchini or cabbage. Agretti looks as if it might make a good substitute for spaghetti. 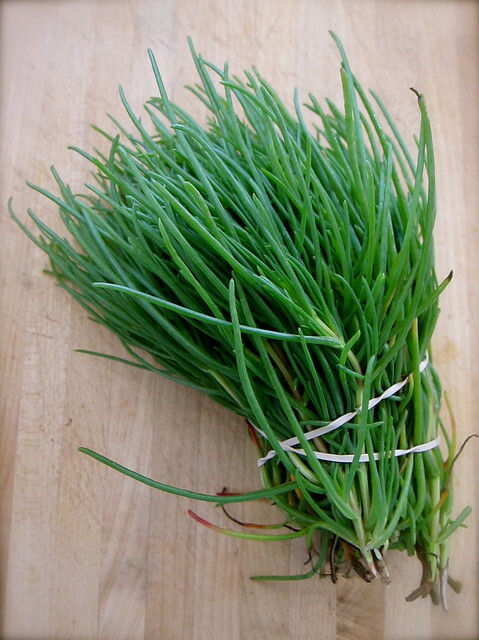 I just ordered agretti seed and will try to grow it this year, even though we’re past its natural season. Do you think it would work to grow it in the fall? We have a small unheated greenhouse attached to our house where I’ve managed to keep lettuce, and chard growing through March, so I’m thinking agretti might work there, too. Hi, Amber! It’s hard to resist adding new things to the seed shopping cart, for sure! The agretti can be sown from February to November; the trick is getting the seed to germinate and Seeds of Italy advises sowing within 2 months of receiving seed. I’ll be posting growing tips soon! It is actually not very clear who she is. It may be clear to regular readers of the blog. I believe she is a friend for whom the blogger made the dish. I loved reading the story — a bit of an odyssey, really. I feel I should try growing some agretti, but I am such an inconstant gardener! The only clue is it seems Veronica is also gluten-free… ;) Since you live in the Bay Area, I would imagine that you’d be able to find agretti through one of your local farmers’ markets! Would love to try it, is Wake Robin selling it the farmers market? I have never seen it before. I love trying different vegetables! Hi, Rhonda! This is the first year Wake Robin’s growing agretti, and we hope they’ll have enough to bring to market — if you don’t see it, ask for it! I planted some agretti seed from Seeds of Italy and direct-seeded into my herb bed. I never saw a single sprout. Desperate as I am to grow this stuff to use as a wheat-free pasta substitute, I ordered more agretti seeds from Gourmet Seeds and started seeds from both companies in Jiffy peat pellets under lights. When they first appeared, they looked like what might sprout after a nuclear disaster — totally non plant-like! Got about 50% germination on both brands. Ten days later, they are tiny red sticks with a couple of thin green leaves. Still not impressive, but they’re alive and growing. I’m going to let these get to a pretty good size before I transplant to the garden. Hello MJ, thanks so much for your agretti update! We seeded a crazy amount in our second attempt at direct seeding, and the results have been better so far. You’re absolutely right, definitely alien-looking seedlings!